Battery Park City residents can now rely on more than just a line of people and distant shadows of the Downtown Connection bus to determine its arrival. 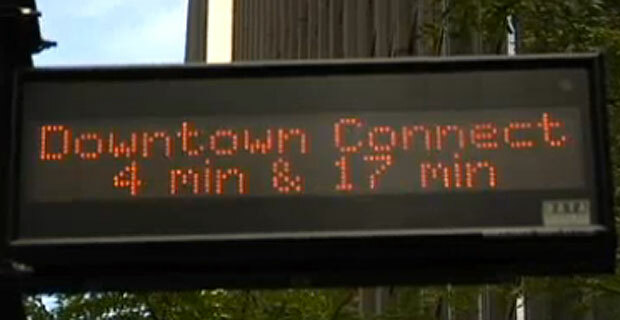 The Downtown Alliance has installed countdown clocks at seven main stops along the Downtown Connection bus route. The bus route connects several main landmarks downtown. The clocks were installed and include the The World Trade Center, The Financial District, The South Street Seaport, City Hall, Tribeca and Battery Park stops. Over 836,000 residents and visitors take the Downtown Connection every year. A free service provided by the Downtown Alliance, the buses will be equipped with GPS systems that will communicate with the countdown clocks. The clocks will track the arrivals of the next two buses to help riders make the best use of their time. The countdown clock should conceivably help add ridership for the buses with a definite arrival time. “Riders of the Downtown Connectionâ€”the Alliance for Downtown New Yorkâ€™s free bus service in Lower Manhattanâ€”will now know exactly when the next bus will arrive. The Business Improvement District has installed seven LED signs, which list the next two arrivals, along the 37-stop route. The NextBus program uses Global Positioning System tracking satellites to provide accurate vehicle arrival/departure information and real-time data to passengers waiting at selected Downtown Connection stops. Funding for the program was secured by New York State Senator Daniel Squadron and established in coordination with the New York City Department of Transportation (DOT). Thanks to a grant from Goldman Sachs, two additional signs will be installed in Battery Park City in the coming months. Although the use of countdown clocks will conceivably increase ridership for tourists, residents are still reeling from the loss of the W Train and M9 lines. Leaving the question on when residents will be able to have reliable transportation OUTSIDE of the neighborhood?